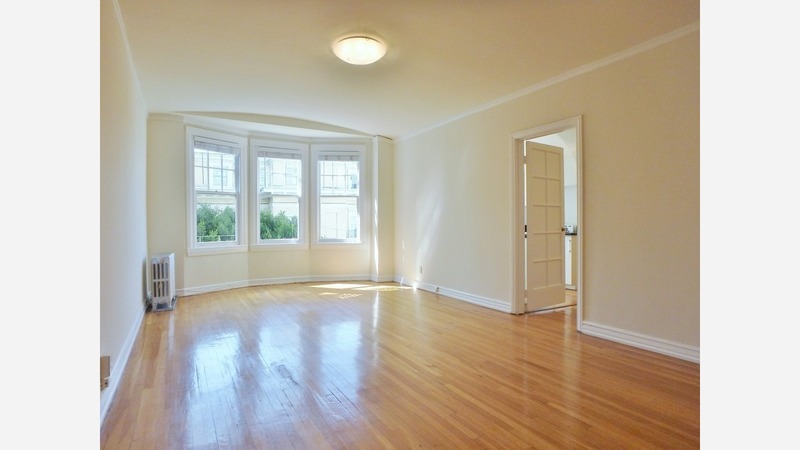 What Will $4,200 Rent You In San Francisco, Right Now? According to rental site Zumper, the median rent for a 1-bedroom apartment in San Francisco is $3,379. Home-hunters who are prepared to pay $4,200 per month, will enjoy more options, however. Here's a look at the latest listings in that ballpark, but note that these prices and availability are subject to change. Listed at $4,200/month, this 827-square-foot studio condo is located at 1310 Fillmore St. In the furnished condo, you can anticipate a dishwasher, in-unit laundry, hardwood floors, generous closet space, stainless steel appliances and ample natural lighting. Building amenities include garage parking and storage space. Cats and dogs are not permitted. Next, there's this 1-bedroom, 1-bathroom condo situated at 1545 Pine St. that's also $4,200/month. The building has garage parking and a roof deck. Inside the sunny condo, there are hardwood floors, a private terrace and built-in storage features, but cats and dogs aren't permitted. This 1-bedroom, 1-bathroom apartment at 1895 Jackson St. (at Franklin Street) is going for $4,200/month. In the unit, you'll get hardwood floors, a dishwasher, a walk-in closet, built-in storage features and great natural lighting. The building features on-site laundry, garage parking and an elevator. Pet guardians, take note: cats are negotiable. Next, check out this 570-square-foot 1-bedroom, 1-bathroom condo located at 3420 18th St. that's listed for $4,200/month. In the sunny unit, you'll get hardwood floors, a dishwasher, in-unit laundry and great storage space. When it comes to building amenities, expect garage parking, a roof deck, an elevator and secured entry. Pets aren't welcome. Located at 1155 Pine St., this 642-square-foot, 1-bedroom, 1-bathroom apartment is listed for $4,100 month. In the furnished unit, you can expect hardwood floors, a dishwasher, built-in shelving, generous closet space, stainless steel appliances, granite countertops and ample natural lighting. The building features on-site laundry and an elevator. Cats and dogs aren't permitted. Here's a 1-bedroom, 1-bathroom apartment at 208 Mallorca Way that's going for $4,100/month. In the furnished unit, there are in-unit laundry, garden access, hardwood floors, a patio and stainless steel appliances. Pets aren't welcome. Next, check out this 1-bedroom, 1-bathroom apartment located at 336 Castro St that is listed for $4,100/month. In the sunny unit, tenants will enjoy hardwood floors, high ceilings, a dishwasher, in-unit laundry, a walk-in closet, ceiling fans, stainless steel appliances and bay windows. The building boasts a roof deck, storage space and secured entry, and both cats and dogs are permitted. Located at 600 S Van Ness Ave., here's a 710-square-foot 1-bedroom, 1-bathroom apartment that's listed for $4,100/month. In the furnished unit, you can expect hardwood floors, a dishwasher, in-unit laundry, generous closet space, ample cabinet space, high ceilings and a deck. The building offers assigned parking, outdoor space and an elevator. Good news for pet guardians: cats and dogs are welcome.